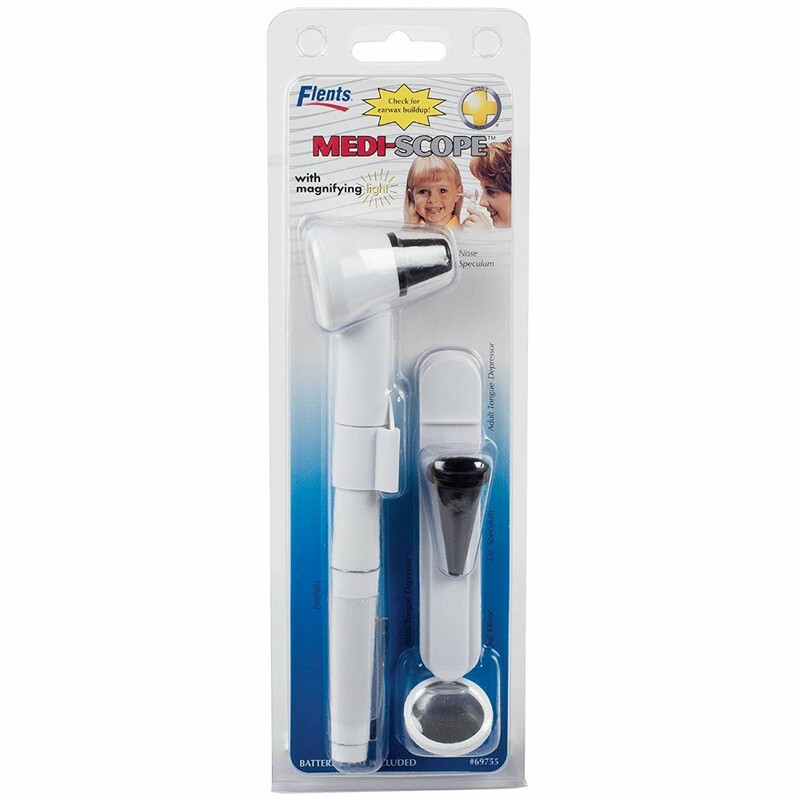 The Medi-Scope™ Kit contains seven pieces: 1) An ear speculum; 2) Eye/nose speculum; 3) Penlight; 4) Magnifying head piece; 5) Oral mirror; 6) infant tongue depressor; and, 7) adult tongue depressor. The Medi-Scope™ was designed to easily inspect eyes, ears, nose, and throat at home to will help you provide our doctor details on your family's health. Reporting this information can result in prompt medical treatment. The Medi-Scope™ is not intended to replace the expertise of your doctor, but rather to work with your doctor for better and quicker response to signs of problems. 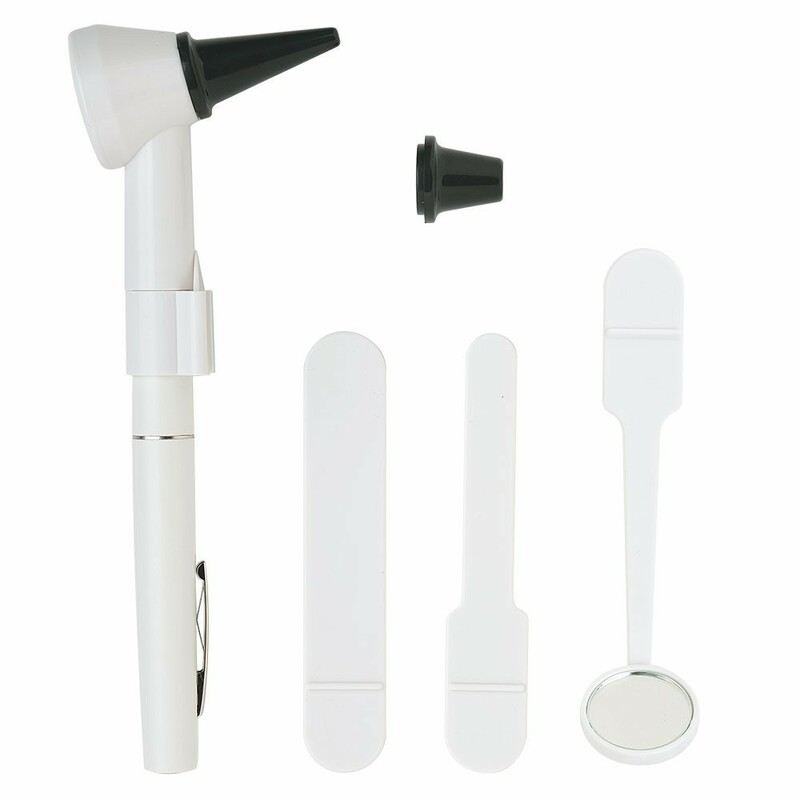 May be used to check for ear wax build up and with the Doctor Easy Elephant or Rhino Ear Wash Systems. Requires 2 AAA Batteris (NOT Included). *Requires two AAA Batteries -- NOT included. Information from the Manufacturer, Apothecary Products, Inc. Requires two AAA Batteries -- NOT included. The Medi-Scope™ was designed for home use to easily inspect eyes, ears, nose and throat to provide better information to your doctor on family illnesses and progress after treatment. The Medi-Scope™ is designed to deliver extra bright, pre-focused high intensity light, which when used with the magnifying head piece and attachments, can expose problems in the mouth, ears, nose, or throat. Reporting this information to your doctor can result in prompt medical treatment. The Medi-Scope™ is not intended to replace the work and expertise of your doctor, but rather to work with your doctor for better and quicker response to signs of problems. This kit contains 7 pieces -- penlight, magnifying head piece, oral mirror, infant tongue depressor, adult tongue depressor, ear speculum and eye/nose speculum. Complete instructions are included inside. Request 2 AAA Batteries (not included). It is recommended that you use the Medi-Scope™ to inspect the eyes, ears, nose and throat of family members while they are healthy, to familiarize yourself with the visual properties of healthy tissue. This will allow you to identify changes that may occur at a later date allowing you to communicate these changes to your doctor. The magnifying head piece and individual attachments, except the penlight, should be washed before and after each use with warm, soapy water and then wiped off with rubbing alcohol. Allow to air dry. Do not immerse the pieces in boiling water or place in dishwasher. Do not allow moisture or water to get inside penlight. Care should be taken to avoid scratching the lens of the magnifying head piece. The Medi-Scope™ uses 2 AAA replacement batters (not included). When the light in the penlight becomes dim, replace with 2 AAA batteries. Simply unscrew the penlight dispose of the old batteries properly, and insert new batteries.